Purchase this product now and earn 2,726 Reward Points! 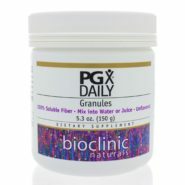 PGX (PolyGlycopleX) granules are an unsweetened highly viscous combination of well purified water-soluble polysaccharides derived from konjac root, sodium alginate, and xantham gum. Viscous fibers have been shown to reduce postprandial glucose concentrations and lower total and LDL-cholesterol, primarily by forming a gel matrix which slows gastric emptying. These viscous granules also trap ingested carbohydrates and lipids inside the gel matrix, decreasing the transport as well as the uptake of glucose and cholesterol at absorptive surfaces. 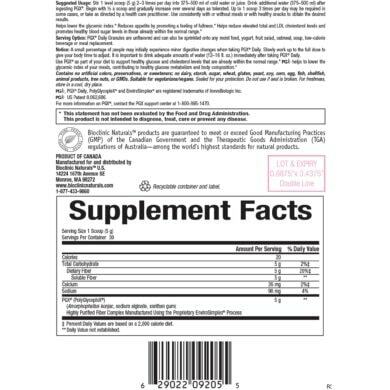 Clinical trials have shown that in addition to the benefits of glucose and lipid reduction, highly viscous fibers were found to lower insulin secretion and C-peptide in response to carbohydrate meals, and also improve glucose tolerance. Viscous fibers effectively reduce the glycemic index of foods consumed simultaneously, by preventing the postprandial spikes in blood glucose concentration.5, 6 Fiber viscosity has also been associated with increased satiety and reduced appetite; in a randomized trial, PGX reduced hunger and prospective consumption when combined with a low calorie diet, and in an earlier trial enhanced weight loss and reduced percent body fat when used in concert with lifestyle changes.7, 8 PGX Daily Granules allow for easy dosing, with 5 g of PGX per scoop, and are unflavored to allow mixing with a variety of beverages and foods. Stir 1 level scoop (5 g) 2–3 times per day into 375–500 ml of cold water or juice. Drink additional water (375–500 ml) after ingesting PGX. Begin with ½ a scoop and gradually increase over several days as tolerated. Up to 1 scoop 3 times per day may be required in some cases, or take as directed by a health care practitioner. Use consistently with or without meals or with healthy snacks to obtain the desired results. 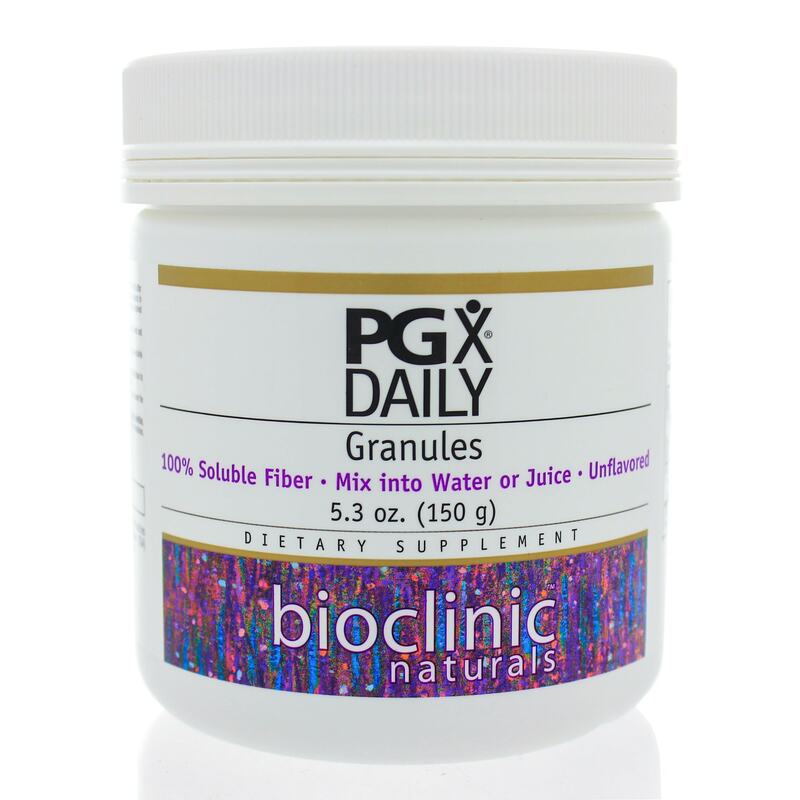 Serving Option: PGX Daily Granules are unflavored and can also be sprinkled onto any moist food, yogurt, fruit salad, oatmeal, soup, low-calorie beverage or meal replacement. Contains no artificial colors, preservatives, or sweeteners; no dairy, starch, sugar, wheat, gluten, yeast, soy, corn, egg, fish, shellfish, animal products, tree nuts, or GMOs. Consult a health care professional prior to use if you are under 18 years of age, pregnant or breastfeeding, or have any health concerns. If you are taking medications, take one hour prior to or two hours after taking PGX Daily. If your goal is to achieve weight loss, or if you are diabetic or on cholesterol lowering medications, consult a qualified health care professional prior to use. Those with a known allergy to the fibres in PGX should avoid it. Individuals at risk for intestinal obstruction, such as those with systemic sclerosis, should increase fiber intake with caution. A small percentage of people may initially experience minor digestive changes when taking PGX Daily. Slowly work up to the full dose to give your body time to adjust. It is important to drink adequate amounts of water (375–500 ml) immediately after taking PGX Daily. A reduction in serum glucose concentrations by PGX may require a lowering of the dosage of any antidiabetic medications, and serum glucose should be monitored closely to prevent hypoglycemia.9 Oral medications may need to be taken one hour prior or two hours after PGX, to prevent a slowing down in their absorption. 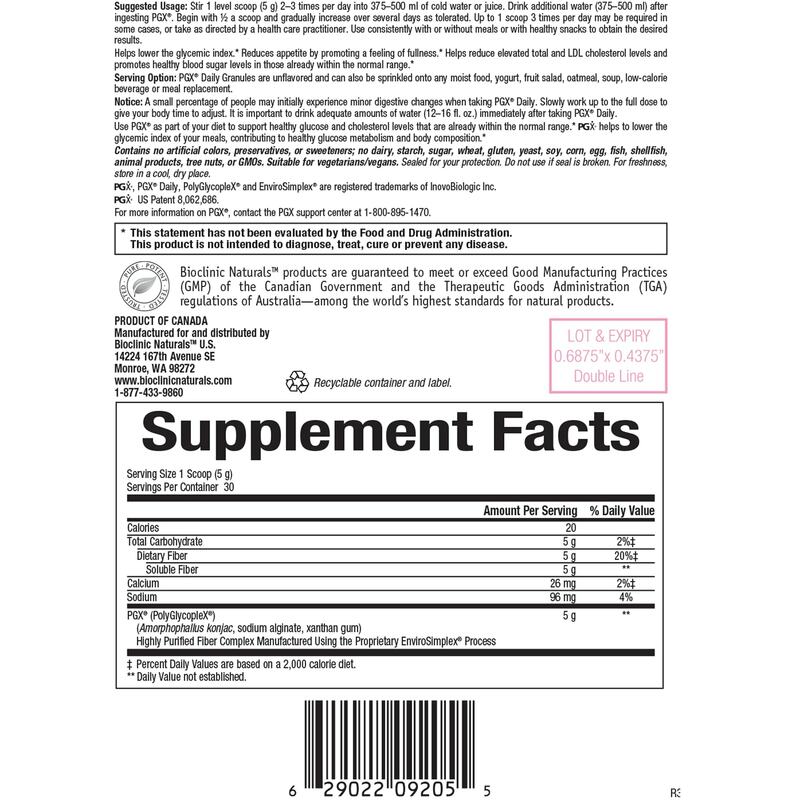 Similarly, fat-soluble vitamins should be taken separately.